The Tenants Paid Their Rent On Time! Haha, April Fool’s! The streak continues. Except for the once immediately after our “unappreciated” email, the streak is unbroken. What Are They Doing With All That Water? As part of our lease agreement, the tenants requested Water be included in the rent. Now I see why; the bill was $72! * The most our bill ever was (including watering the lawn in summer) was $55. Is the water just turned on 24/7? I’m glad heat’s not included. They probably would have the thermostat at 80! *This is still nowhere near the amount we pay for water in Richmond ($80/month [ugh!] vs. $50/quarter in NH), but a 50% increase is shocking! We couldn’t sell our NH house in time for med school, so we’re renting it out. 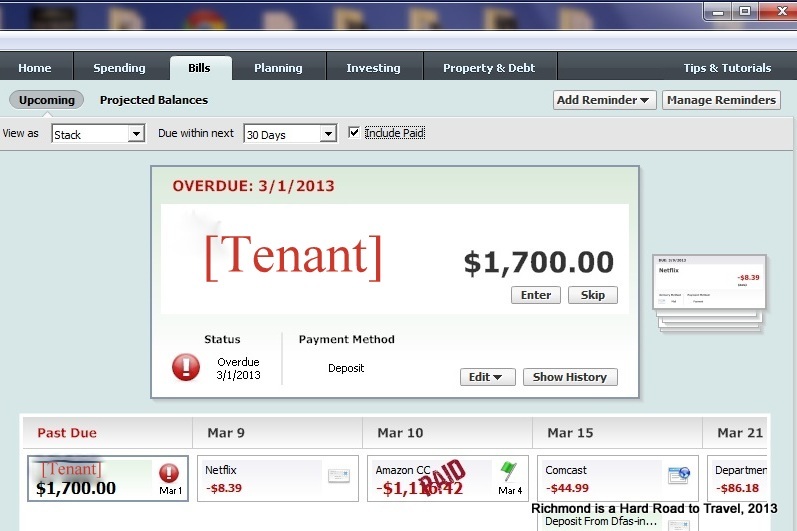 Rent is due in our hands on the first of the month. It has never been paid on time. The first month was late because they wanted to do electronic transfers instead of mailing a check,* but found out too late that their bank would charge them a fee, so the check arrived on the 4th. I considered this excusable, but didn’t realize that it was just the start of a pattern. The next month the check arrived the 5th, postmarked the 1st. This month it still hadn’t arrived by the 5th (yesterday), so I emailed the tenant asking her to please send the check earlier in the month because it still wasn’t here, it was due the 1st, etc. And the thing is if it came tomorrow, there would be a $50 late fee. So we’ve missed out on that. Annoying. I could use that $50 after the vet visit last week. Three late payments means technically we could evict them, but it’s not worth the hassle. The checks are late, but they always go through. Also, we can’t afford for the house to be empty. * For the longest time she was trying to get out of mailing anything. It was weird. Before the electronic transfer idea, she wanted to give the check to our real estate agent every month instead of mailing it to us. Um, so he could mail it to us? I don’t know. To spend $1 in tolls to save a $0.45 stamp? So weird.